Aquamarine counts among the gemstones that have coined their own color type. In nature, clean tropical lagoons, mountain lakes, calm Mediterranean bays are frequently described as ‘aquamarine green or blue’. Though less romantic, I like the comparison to a well maintained infinity pool in full sun light or at night with strong internal lightning (not that I own one, but I have seen them). In addition to its unique and attractive green-blue, fine aquamarine produce an intense shining brilliancy (if cut well). Within the beryl family only emerald can claim a higher public status. Aquamarine, however, is found in larger and cleaner pieces than their famed cousins. The color of aquamarine depends on its iron content in relation to chromium. Emerald is chromium based, aquamarine is iron based. For some reason the trade has long tried to burn away the green component in aquamarine but untreated greenish aquamarine has gained more and more fans over the last years. The basic rule, supply-chain control aside, is the greener the aquamarine, the less risk of heat treatment. In any case, all our aquamarines are accompanied by an independent gem-lab report and are free from any treatment what-so-ever. I here also like to pay homage to rough aquamarine as shown in the image. Though this is only a simple shot of a no-thrills piece of rough, it is remarkable how unique and strong the color without any polish or extra light. Other than many gemstones, aquamarine can be of incomparable beauty in the rough. With more time to experiment, I would love to create some jewelry with selected rough aquamarine. A full natural crystal gleaming in liquid blue and green on a stylish pendant should win international jewelry competitions, but daily SEO (like here) keeps me from doing the pretty jobs. With their bright colors, aquamarines do not like windows, nor inclusions but are exquisite candidates for precision cuts. 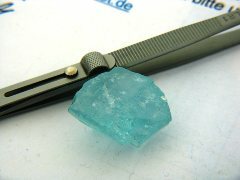 Even with big and clean rough aquamarine commanding top prices, they are available for precision cutters (as opposed to big clean unheated ruby crystals for example). Learn About Aquamarine on Photo.